Recently I was contacted by the lovely Jenni from JD Williams to ask if I would be interested in reviewing some clothes from their website in a contemporary versus classic campaign. Now to be honest I had heard of this company but associated it with older fashion. However what I didn't know is that the clothes are suitable for women of all ages, in sizes 12- 32, and I feel it appeals to those that like high quality classic clothing. Lorraine Kelly is leading their marketing campaign at the moment and she is a perfect ambassador, a lady who is stylish and fun and who loves fashion. Of course fashion comes around in circles and the 70s jumpsuit, polka dot dresses of the 30s and midi skirt from the 40s are all fashion items of their time that have come back into fashion once again this year. However I am a firm believer in finding a style that suits you and then accessorising to make the outfit current and on trend. Often that means taking something classic and giving it a twist to bring it contemporary and up to date. One of the styles that suit my shape is the fit and flare dress. 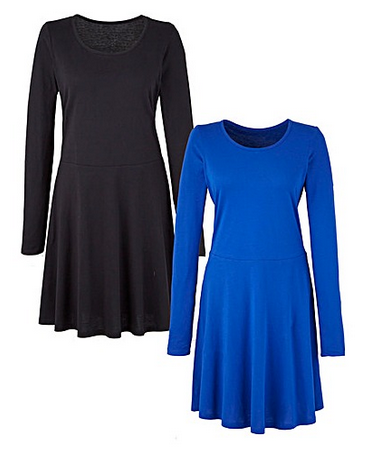 These dresses skim and flatter and give me a more defined waist, so I was really pleased to find a pack of two fit and flare dressed on the JD Williams site for only £26. 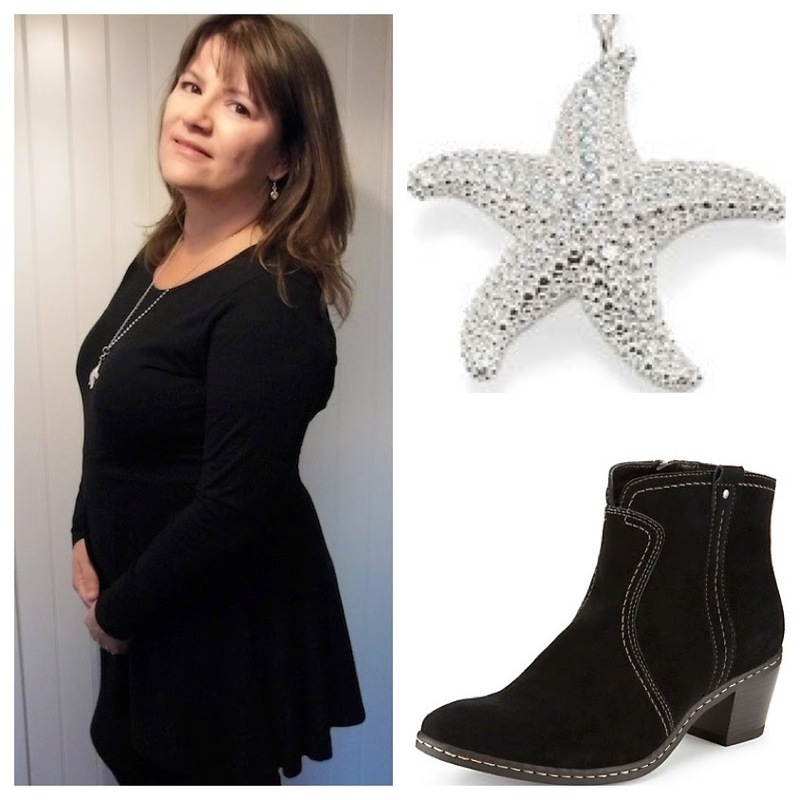 I styled the black classic dress to make the look contemporary by adding black leggings and funky cowboy boots. The jewellery I added included a long length silver necklace with a starfish from Thomas Sabo and sparkling heart earrings from Warren James Jewellers. The handbag I would match with it would be my new purchase from the American luxury brand Coach as it's a simple classic design. I also had a chance to review this funnel neck coat. I love the styling of this coat, as it is classic yet still has up to the minute styling, such as the funnel neck and nipped in waist. 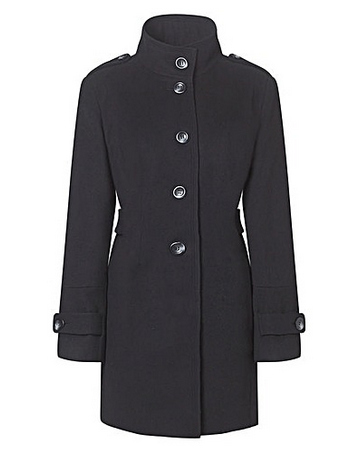 I love this coat as it is the right length for my 5ft 2in frame, not too long so it doesn't swamp me. It has a smart yet structured feel to it, yet it is incredibly easy to wear. A real wardrobe classic and a major plus point is that is it machine washable... well I never! I find it hard to find clothes in a petite size, but I noticed JD Williams do a good range of clothing for ladies short in stature, but not short on style, so if you are one such lady, my top tip is to check their website out. 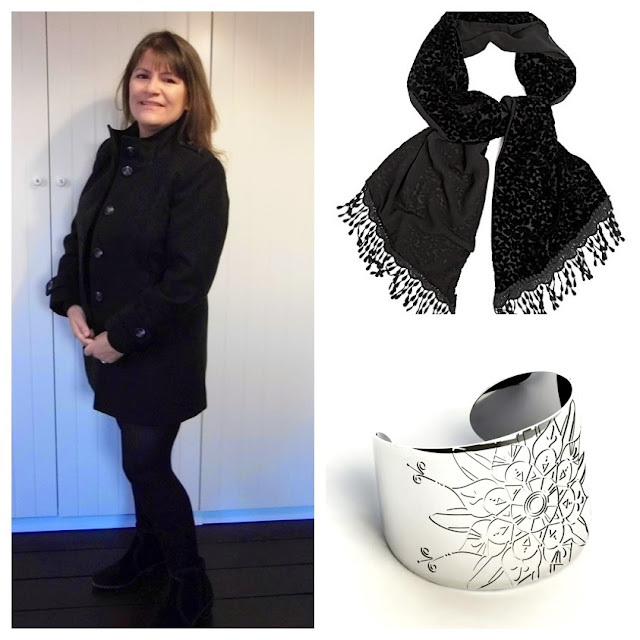 I have styled this coat with a black devore scarf in a supersoft material, also from JD Williams and a beautiful contemporary silver bangle from Jessica Flinn Designer Jewellery. So would I buy from this company again? Well I thought their clothes did flatter my frame, they make a range of petite clothes, the prices were great and the quality very good, so, YES! If you go to the JD Williams website today they have 20% off your first order too, but be quick as I am not sure how long this offer will last. You can contact JD Williams on Facebook to keep up to date with all the latest offers. Tell me what do you think of the items I have picked? Have you seen their latest advert? I really like the clothes and the prices are very good but I'm a size 6/8 with very long legs so nothing for me sadly. It's brilliant the coat is washable as I don't buy dry clean only clothes anymore as I never get round to taking them to be cleaned! That's a shame Jibber. They do petite clothes though. They do and nice quality too. They are very versatile and so easy to wear. I love that coat and brilliant that it can be easily washed too...definitely something I look for in my clothes nw I have children! Yes it's a great idea, as who takes their clothes to the dry cleaners these days? They are great looking clothes! I love the jacket and the boots! Totally love the coat and I want one too. It's a cool classic coat that is for sure.